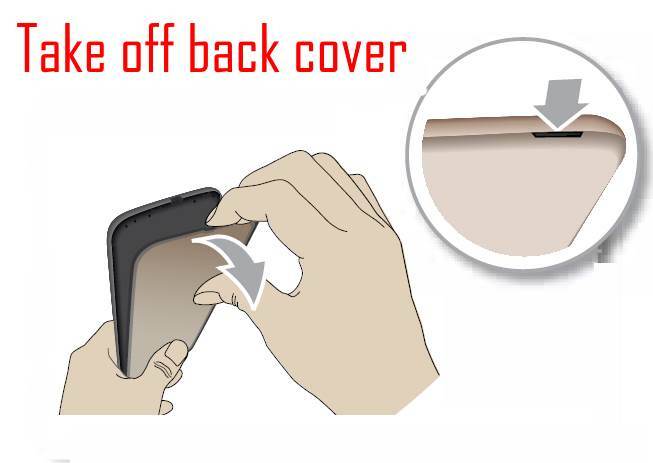 As shown below, you can gradually peel off the back cover starting from the small gap (groove) in the bottom of the phone. You should NOT use any tools, which may break the cover. Just use your hands with a bit (but not excessive) force. You can now see the inside of your Moto G5. Although you can see the SIM card slot now, you should NOT insert your SIM card at this time. Instead, you need to remove the battery first as shown below. After the Moto G5 battery is removed, you can access the SIM card slot to install SIM card for Moto G5. As shown below, in the single SIM version of Moto G5, the SIM card slot is below the micro SD card slot. You can install Moto G5 SIM card by inserting a nano SIM card into the SIM card slot following the shape illustrated. You need make sure the metal part of the SIM card is facing downwards and the clipped corner in the top left . Important: SIM card should be placed in the lower section, but NOT underneath the slot!!!! Micro SD card will not be covered in top. In the top section, you can insert a micro SD card with metal part facing downwards. Do not insert micro SD card into SIM card slot. The micro SD card slot is NOT covered in top. You need inset micro SD card all the way down to hold it tightly. You can use micro SD card as portable storage or internal storage as explained in this guide. For dual SIM version of Moto G5, you can find the second SIM card slot as shown below. You can install second SIM card for Moto G5 if you want. If you don’t want to miss calls to the other SIM card when you are engaged in a call in one SIM card, you can follow this guide to make both SIM cards available at all times. 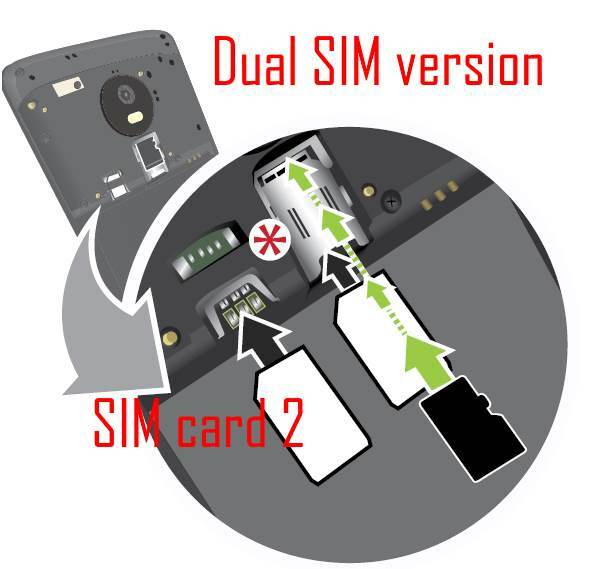 Please note, it does NOT matter whether a SIM card is in SIM card slot 1 or slot 2. You can always set preferred (default SIM card) for calls, messages and mobile data in Settings — SIM card manager. 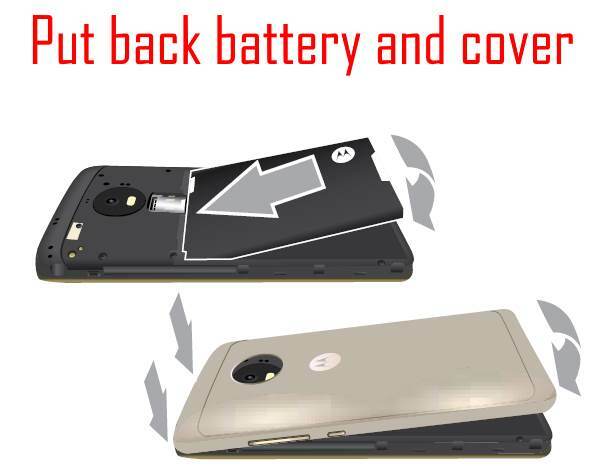 After you install Moto G5 SIM cards and/or micro SD card, you can now put back the battery and back cover as shown below. Now, you can power on Moto G5. SIM card and micro SD card should be detected. For the dual SIM version of Moto G5, if you installed two SIM cards in Moto G5, you need to specify the default SIM card for calls, messages and mobile data. By default, Moto G5 will use SIM card in slot 1 (below micro SD card) as the default SIM card. You can follow this guide to change the default SIM card on Moto G5. Do you know how to install Moto G5 SIM card? Can you find the micro SD card slot in Moto G5? If you have questions or encounter any problems to install Moto G5 SIM card or micro SD card, please let us know them in the comment box below. You can also find and download Moto G5 user manual in you language in Official Moto G5 User Manual and Moto G5 Plus User Manual page. I have an unblocked universal Moto G5 purchased at Best Buy in spring 2018. I have Verizon service in the US but will be traveling overseas and getting temp SIM cards. Will there be any problem with me using a GSM network where I am traveling? If it’s the universal model, it should work with GSM networks. Thanks for the quick reply, Exactly what I need to know. I understand G5 uses nano SIM, but can the slot hold a micro SIM? Do I need an adapter? I want to be able to insert a micro SIM when visiting other countries. The SIM card slot in G5 can only hold nano SIM card. There is no space for an adapter. 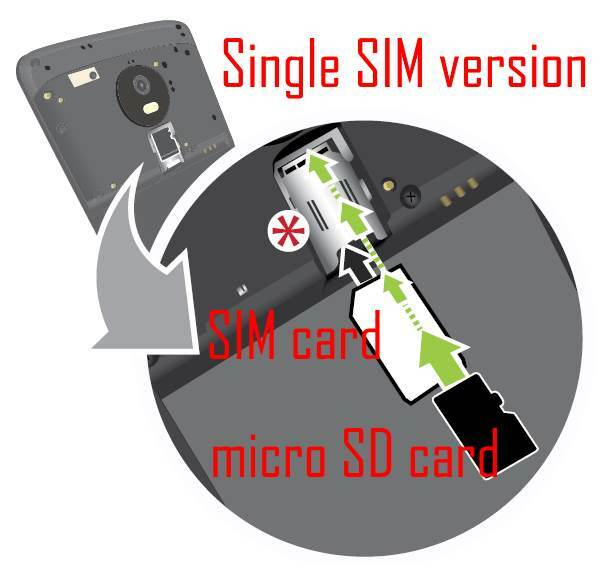 In most countries, the 3-in-1 SIM card (nano, micro and mini) is issued. You can detach it based on your need.